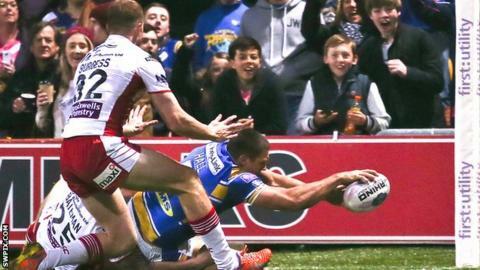 Leeds Rhinos returned to the top of Super League as they scored five tries in their victory over Wigan Warriors. Danny McGuire's score and Zac Hardaker's fine individual try gave the hosts the early advantage, before Tony Clubb went over to close the gap. Tom Briscoe's try saw Leeds lead by 10 points at half-time. Ryan Hall finished off a fine Rhinos' move, Scott Taylor scored a try for last year's champions, while Liam Sutcliffe gave Leeds the final say. Wigan, who saw their eight-match winning run in all competitions come to an end, remain fourth, five points behind Leeds. The hosts made a perfect start inside two minutes when Sinfield's kick was patted back to McGuire by Ryan Hall for a 4-0 lead, with Sinfield also adding the extras. A great piece of skill by Hardaker saw him dummy his way into the right-hand corner, but Sinfield's kick was less accurate this time. Clubb burst through from dummy-half to dive over to secure Wigan's first try and Matty Smith's kick closed the gap to four points. But a perfect pass from Kallum Watkins sent Briscoe in for the home side's third try, while Sinfield's conversion ensured Leeds led 16-6 at half-time. Joel Moon's left-footed delicate kick found Hall, who ran at speed on the move to go over and Sinfield successfully landed his third kick from four - this time from a tight angle on the touchline. Taylor burst through to go over for late consolation try for Wigan and Smith kicked the extras. There was even time for Maguire to set up replacement Sutcliffe, who dropped his shoulder to charge over for a fifth Leeds try and Sinfield converted again. Leeds Rhinos coach Brian McDermott: "Without the tough stuff at the other end of the field, you don't get to score those tries. "It was a satisfying win. It was a very tough game and we lost our way a little bit, especially in the first half. "It got a bit scrappy in the second half, but that happens sometimes when the game is played at an intense level we haven't been at for a while. "The way we stuck at it was probably the most satisfying thing." Wigan Warriors coach Shaun Wane: "I thought the best team won. They they ended their sets better than us. They're a fantastic team. "They have a lot of players who know how to win games and they managed the game well. "Our effort was really good but we were dumb at times." Leeds Rhinos: Hardaker, Briscoe, Watkins, Moon, Hall, McGuire, Ablett, Leuluai, Sinfield, Peacock, Clarkson, Achurch, Delaney. Replacements: Kirke, Sutcliffe, Singleton, Bailey. Wigan: Bowen, Burgess, Goulding, Sarginson, Gelling, Green, Smith, Taylor, McIlorum, Dudson, Bateman, L. Farrell, Clubb. Replacements: Hughes, Crosby, Williams, James.